Today marks the beginning of a new path and direction for you all our newly sworn in citizens. It is the affirmation of your allegiance and commitment to serve Samoa and its people to the best of your abilities, through the divine leadership of our Lord, whom this country worships and glorifies. On behalf of our government and the people of Samoa, I congratulate you all, who have taken the oaths of allegiance, as citizens of Samoa before Cabinet this afternoon. We welcome you with open arms. Our citizenship defines our identity, inheritance and authority as Samoans. 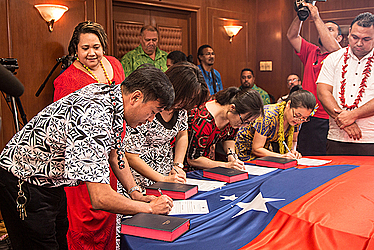 It is our God given right to live freely and harmoniously in this country; and to exercise our unique talents to contribute to the social and economic wellbeing of Samoa. Today you have been given that right; the right that must be treated with respect and truthfulness. I gathered that the majority of you have qualified for citizenship by virtue of your marriage to Samoan citizens, and by virtue of your permanent residency status. Central to the assessment of your eligibility, is solid evidence of your families’ stability for years, your good health and character, and your firm understanding of the responsibilities and privileges of being citizens of Samoa. I thank you for the years of your faithful service to Samoa, and encourage you to press on and continue to contribute positively, to our country’s growth and prosperity – your country now as from today after my speech. We cannot dwell anymore on the old myth of isolation and smallness. The challenges of modern times are real, and compel us to think and plan strategically, in order to survive the realities of globalization. The harmful effects of climate change, non-communicable diseases, transnational organized crimes, cybercrimes, and marine and ocean pollution have been felt all over the world. Amongst the worst affected are small island countries like Samoa. Central to our response is acceptance of our shared responsibility. We must respond collectively as a country to address these global challenges. We should not dwell on indifference and division. Unity is our strength, and the foundation of our culture and identity. Our collective responsibility is to ensure that our children and future generations will live comfortably, and are taught to be responsible custodians of our scarce resources. Government has formulated key strategies to enhance our resilience against the fury of natural disasters, strengthen our national security responses, manage alarming rates NCDs, and to generate new businesses and investments to provide more employment opportunities for our people. This is being done through meticulous integration of our national priorities with regional goals and sustainable development goals. This of course can be accomplished if all citizens take ownership of our national efforts and programmers. The message for you all today is to serve your country with humility, honesty and commitment. We should neither lose sight of our national duties as committed Samoans, nor forfeit the confidence of your fellow citizens. You have lived in Samoa for some time now and you have experienced that our people are very friendly, kind and very nice, attend church every day and pray regularly but some, not many, behave like chickens – it’s all because of this thing called “Democracy – a foreign idea” which the world adopts – so that when our chiefs in the village say no – the Bad and the Ugly say yes and then wave the Constitution to the Chiefs – Now that you are Samoans, be good – because that is a true Samoan behaviour and you are no longer aliens. God bless you all our new citizens and your Samoan families. God bless Samoa. Soifua.